« It Occurs to Me . . .
Hopefully when the pulmonologist sees how much weight I’ve lost at my followup appointment in August he’ll schedule another sleep study and we’ll find out that I no longer need the CPAP. (Maybe I’m getting my hopes up too soon but it’s possible!) Until then, I need to do something about the clenched jaw. The dental hygenist suggested I see a massage therapist, so I did. The woman is amazing. Before she does any work, she does hands on reading of energy, muscles, etc. She then proceeded to work on my head, neck and mouth for an hour. I could feel tight muscles loosen up and go soft. She also suggested that I stick my tongue between my teeth and lips when I go to sleep and see if that prevents my jaw from clamping down. During the treatment she asked me what I obsess over before I go to sleep that results in the tension. Most nights I don’t. Unlike some rougher times in my life, I don’t have chronic, ever lingering anxiety. I get tense over some situations. If something upsetting or annoying happened during the day I might still focus on that with repetitive thought or replay conversations in my mind. The massage therapist and I both observed how quickly we go to what might be wrong and look for the negative. I have a happy life. I recognize and appreciate this every day and don’t go around waiting for the sky to fall or something else to happen to mess up things and take away my happiness. However, today I’m musing over whether I should stop acting like happiness is commonplace and do more to celebrate its presence in my life. Over on Reinventing Fabulous, Sundays are usually given to sharing things that made us happy during the week. That’s a good start because the exercise helps us connect to those moments or events. Today I’m going to experiment with obsessing over what’s right and celebrate my happy life. It’s already a good day. I enjoyed Tai Chi class this morning. The rain clouds have passed and I have several plants in the car ready to be arranged in planters. I ordered an quirky, adorable planter that’s shaped like a brightly colored teacup. (I have another teacup planter also on order but it hasn’t arrived yet.) Just the planter makes me smile and I can’t wait to see it with the flowering plants I bought a short time ago. I have another planter for the pool deck and a flowering shrub that I’m going to plant beneath some palm trees. I love flowers! Right now I have a small arrangement of peachy-pink roses on the table in front of me. Once I finish planting, I’ll have brightly colored flowers inside and out. That’s a hit of happy I’ll enjoy day after day. When I’m done I’ll take pictures and share my happiness here. That will be another form of celebration. Enjoy your day, everyone. Look for what’s right and spend some time obsessing over it. Celebrate what makes you happy! Edited to add pictures. 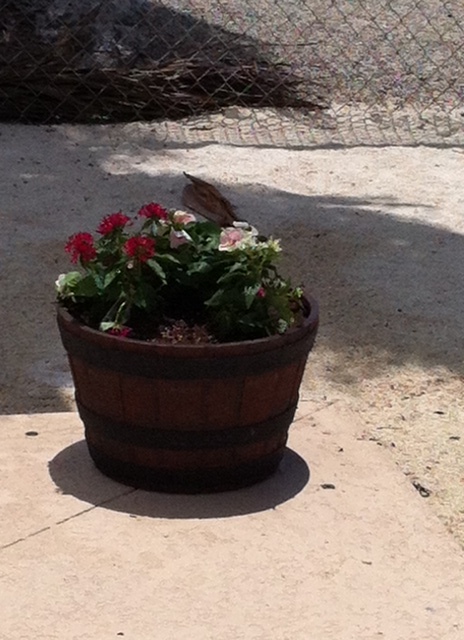 I wish I’d found a whiskey barrel planter that was a bit taller, but this is still fine. It will also be easier to move in case of a storm event later this season. 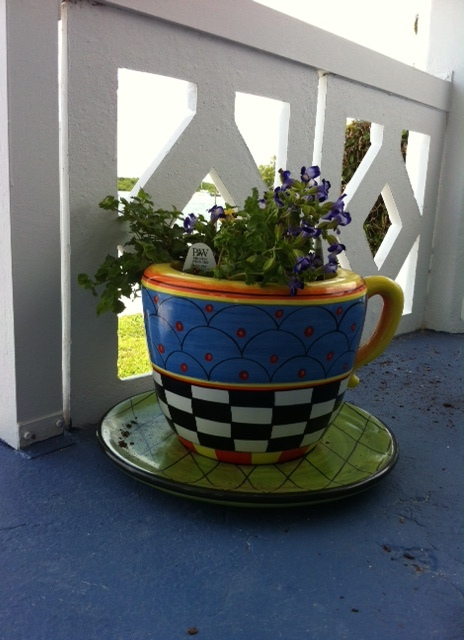 I totally love my funky tea cup planter. Another one that’s patterned like a French postcard is due today or Monday. I go outside, look at them and smile. The funny thing was, I pretty much love my job. The negatives tend to be minor & about 5% of any given headaches in my work. But still, because that was what I was focusing on, it appeared I was unhappy. Plus, I really am a happy person. I’m incredibly blessed in my life — I was raised in a loving family, I have the best husband ever, I have incredible supportive friends, we are financially stable … the list just goes on and on. So I started doing a (mostly) daily post of at least three good things from the day before. (I don’t always do it on the weekends, because I’m not near the computer; I usually sum up the weekends on Monday.) It helps remind me that there is more joy than sorrow in my life and that I need to affirm it on a regular basis. It helps remind me that even in the challenges I have, to try to find the silver lining. I still do the occasional rant, because maintaining an positive outlook doesn’t mean that irritation, frustration, and the need to smack people goes away, and I still need to vent sometimes. But I think that I’m handling those irritations & challenges better, that I specifically look for what in the situation can be seen as a good point, rather than wailing about just the awful parts. It’s funny, the kinds of things you can do to try to take control of your outlook on life. Reminding myself to regularly identify good stuff has helped me enormously! Excellent and so positive. Plus I love the planter. My bestie got me a red and orange polka dot teacup planter for my bridal shower three years ago and i loved it too much to put it outside…it’s on top of my kitchen cabinets making me smile. I LOVE the tea cup planter! That is so cute! Last November I did a month of gratitudes on my blog, big things and little things I was grateful for and I do think I made me more conscious of the good things in my life and how much I have to be happy about. I got tired of the daily blogging, but I still try to remember to do this, particularly when I’m feeling down. Love the tea cup flower pot. Thanks for the pictures. Our deck makes me happy these days as well. 😀 Lots of flowering plants and the morning glories are starting to extend along the railings. Good words for me as I tend to look around and wonder what will fall from the sky next. I need to obsess over happiness and non-anxious times, and replay them over and over. Same with successes rather than failures. It’s one thing to be prepared for difficult times, it’s something else to live for them. Awesome, Mary! I look forward to your pictures, too.